While the Royal Navy was experimenting with aircraft carrying submarines, the French Navy continued to pursue the unconventional submarine cruiser concept. The pinnacle of their (and all other navies’) experimentation was the submarine Surcouf which was commissioned in 1936. Surcouf displaced nearly 4,400 tons and was outfitted with dual 8-in. guns, 10 torpedo tubes, nearly half a dozen anti-aircraft and machine guns and a spotting aircraft in a stern hangar. Never before nor since have such large guns been mounted on a submarine. Named after a 19th century French privateer captain, the Surcouf was intended to be deployed as a submersible raider with the capability of shelling shore targets, merchant ships and unsuspecting surface warships and then sneaking away while submerged. During World War II, the Surcouf had a rather lackluster reputation in the hands of the French Navy and Free French Navy. Barely escaping capture when the Nazi blitzkrieg overran France, the Surcouf fled to France where the Royal Navy later boarded her at gunpoint during Operation Catapult and the resulting confusion ended in the deaths of several sailors. The boat was then turned over to the Free French Navy and was used to assist in a coup launched on December 25, 1941 against the Vichy French administrator of Saint Pierre and Miquelon – a French colony off the coast of Canada. Following several months of inconsequential service in which the sub constantly required maintenance, the decision was made by the Free French high command to dispatch Surcouf to Tahiti via the Panama Canal. After a temporary stop at Bermuda on February 7, 1942 the Surcouf sailed for the Canal Zone. The sub was never seen again and numerous theories have been proposed as to her fate. The two most widely accepted theories are that the sub collided with the American freighter Thompson Lykes on the night of February 18th or was sunk by American aircraft on February 19th. The sub has never been located and there are rumors that the sub was carrying a portion of France’s gold reserves, however, this is most likely wild conjecture for several reasons. First, the Surcouf was operating primarily in the Caribbean and North Atlantic in her final months and thus would have had no access to the gold reserves. Second, and more importantly, the sub was experiencing significant mechanical difficulties and it is highly unlikely that gold reserves would have been entrusted to an unreliable vessel. Finally, the Surcouf had been ordered to Tahiti which is an unlikely destination (unless for transshipment) for any gold reserves. In many ways, today marks the 115th anniversary of the beginning of the American “Empire.” In early 1898, the battleship USS Maine was dispatched to Havana, Cuba to protect American interests as Cuba was wracked by a war for independence from Spain. On the evening of February 15, 1898, an explosion ripped through the forward section of the Maine. The ship quickly settled to the bottom of Havana’s harbor taking with her 261 of 355 man crew. Six weeks after the catastrophe, a US Naval Court of Inquiry determined that the sinking could be attributed to a naval mine. Popular opinion was quickly inflamed by the popular press and “Remember the Maine! To Hell with Spain” became a rallying cry for war with Spain. Two months later, in April 1898, war began as Spain declared war on the United States after the US issued an ultimatum to Spain demanding it grant Cuba independence. The war was an overwhelming American victory and had numerous domestic and international consequences. First, the war helped heal the wounds of the War Between the States as former Confederate General Joseph Wheeler (along with Robert E. Lee’s son Fitzhugh Lee, himself a former Confederate commander) proudly led US troops into battle. Second, the war helped propel Teddy Roosevelt to national prominence and ultimately the White House. Finally, the war in many ways marked the rise of the US as an international power as the US gained control of Cuba, Guam, the Philippines, and Puerto Rico. The true cause of the sinking of the Maine remains a mystery, but modern inquiry by none other than the US Navy’s own brilliant Admiral Hyman Rickover has led many to conclude that the sinking was the result of spontaneous combustion of the ship’s coal bunkers and not a Spanish mine. The Maine was later removed from Havana harbor and scuttled off the coast of Florida in 1912. 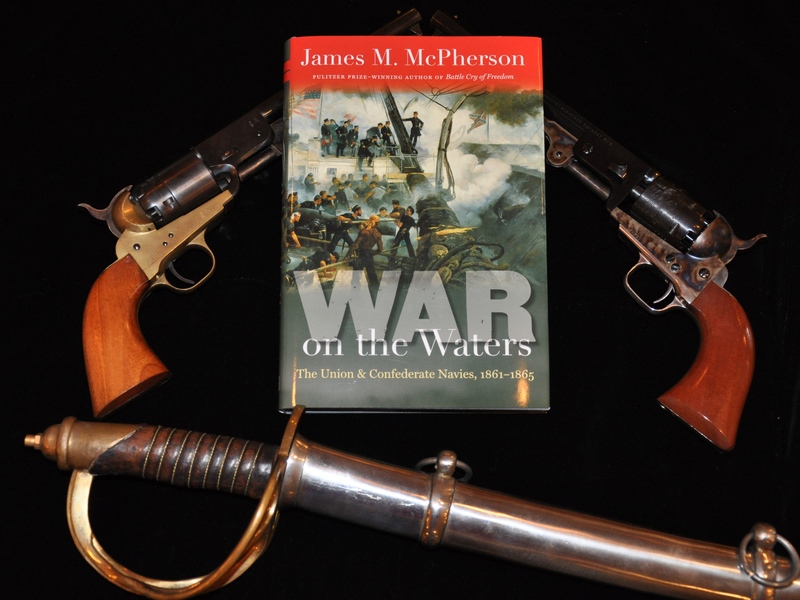 Pulitzer Prize winning author James M. McPherson’s latest book, War on the Waters, is a concise naval history of the American Civil War. Most authors and historians focus on the great generals (Lee, Jackson, Grant, Sherman, etc.) or the great battles (Antietam, Chancellorsville, Gettysburg, Shiloh etc.) and often ignore the vital role the navies played in the conflict both on the rivers of the western Confederacy and the high seas. Entire books have been written on various aspects of the naval war – riverine warfare in the west , blockade running , Confederate merchant raiders , foreign intrigue in Europe and the innovations that made their debut in the conflict. McPherson neatly summarizes each of these topics and arranges them in easily digestible chapters that proceed in chronological order. McPherson’s organization and writing style allow both the uninitiated reader and the Civil War buff to understand the ebb and flow of the conflict and the various personalities, events and inventions that influenced the war. Perhaps most importantly, McPherson accompanies his chapters with strategic or tactical level maps that enable the reader to understand the events which occur in the chapter. McPherson understands the unwritten rule that the inclusion of a relevant map is worth multiple pages of text in helping a reader establish an awareness of the events being described. Along with the maps, various etchings and photos accompany each chapter and neither maps nor illustrations are confined to a few pages in the center or the beginning of the book. This allows the reader to visually grasp the crux of each chapter and makes both the maps and the illustrations more relevant to the narrative being told. Overall, War on the Waters is a fantastic single volume history of the Civil War’s naval history. McPherson hits all of the highlights of the Civil War – CSS Virginia vs. USS Monitor, blockade running, William B. Cushing’s daring raid on the CSS Albemarle, and the first successful attack by a submarine – in only 225 pages. War on the Waters is a welcome addition to the naval literature of the Civil War and will be enjoyed by anyone interested in American history, naval history or the Civil War. Archaeologists in Texas are pioneering a new method of shipwreck preservation – freeze drying the ship’s wooden planks to remove seawater and then re-assembling them. Traditional conservation techniques often involve time consuming electrolysis immersion to remove concretions or prevent wooden items from decaying when exposed to the atmosphere. If successful, the technique could be a significant breakthrough in the preservation of wooden artifacts raised from the deep. According to the Associated Press, the same technique will soon be used to preserve the Newport Medieval Ship which was discovered in 2002 in Wales. The Texas project, a French ship named La Belle, sank in 1685 and was re-discovered in 1995 by archaeologists from the Texas Historical Commission. La Belle was lost in a storm while en route to resupply the French explorer Robert La Salle in his quest to establish a colony on the Gulf coast. More than 700,000 items were salvaged during its recovery and the ship has remained immersed in a chemical solution since its recovery. For more information on the ship and its history, see today’s AP article and the Texas Historical Commission’s website.